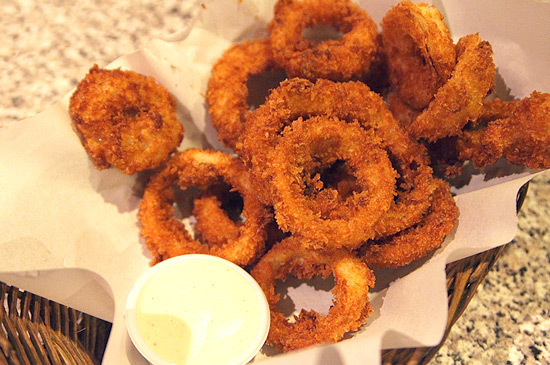 If we could have anything deep-fried, it would be onion rings. (SPOT.ph) Onion rings are curious creatures. On one hand, they tend to play second fiddle to French fries, dutifully standing in when fries are not available. But on the other hand, you do have to pay extra to get onion rings as sides sometimes, and an increasing number of restaurants are offering onion rings separately as appetizers. Whatever role they play, we had a blast digging into plate after plate of these fried and battered gems (and telling ourselves, "Hey, these are onions! They're healthy! Right?") to find the best. The price is pretty amazing for such big and thick onion rings. 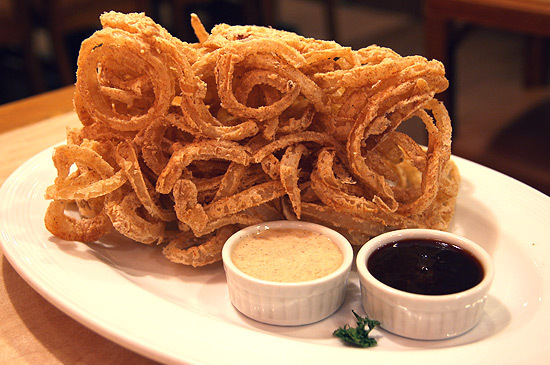 8 Cuts' onion rings are the only one on our list that has a kick of extra flavor-barbecue, to be exact-and we love the crunchy layer of batter that conceals the thick slices of white onions. If the taste isn't enough for you, you can always dip the rings in either the mayo or the ketchup served on the side. 8 Cuts has branches at Power Plant Mall, Makati City; UP Town Center, Quezon City; Trinoma Mall, Quezon City; SM Mega Fashion Hall, Mandaluyong City. 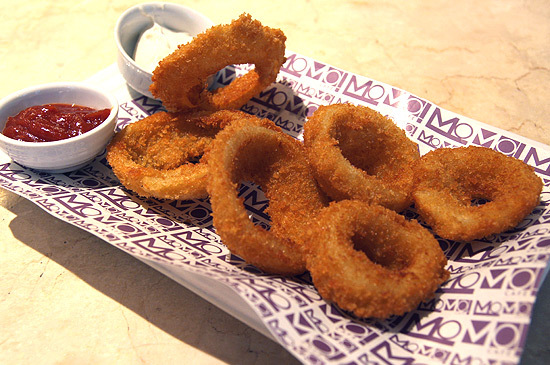 You won't find onion rings on MoMo's menu, but you can bet that they have it-just make sure to ask them. You also won't be getting a huge pile of onion rings, and six pieces might sound modest, but each piece is enormous and generously breaded, although not enough to diminish the natural taste of the onions. 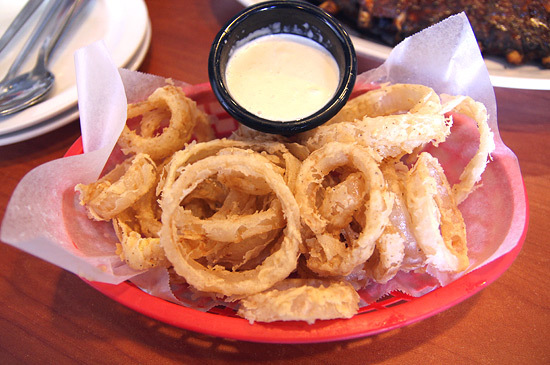 You will want to relish each crispy ring to the last bite. 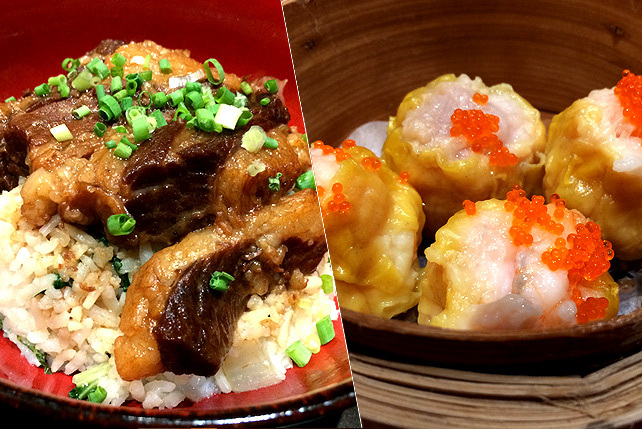 MoMo Cafe is at Eastwood Mall, Libis, Quezon City. These rings are liberally coated with tempura batter (deliciously flaky, crisp, and light), but the onion flavor rises above it all. Curiously, it's sprinkled with salt, which fortunately doesn’t detract from the taste of the onion rings. Another bonus: these rings were not greasy-a common crime in deep-frying. Tender Bob’s has branches in Shangri-La Plaza, Mandaluyong City; Greenbelt 2, Makati City; SM North The Block, Quezon City; Promenade, Greenhills, San Juan. 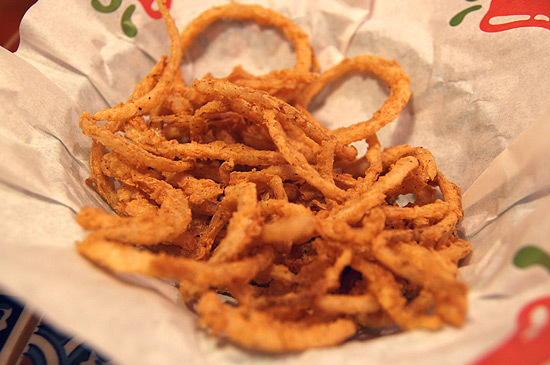 Some onion rings are so heavily wrapped in batter that you can barely get a hint of onion with every bite. Johnny Rockets (pictured here served with fries because they ran out of onion rings to fit a serving, but were thoughtful enough to serve something else) manages to mix both perfectly, with the onions still having a light crunch without being overfried. Johnny Rockets has branches at Tomas Morato, Quezon City; Eastwood Mall, Quezon City; Alabang Town Center, Muntinlupa City; Shangri-La Plaza Mall, Mandaluyong City; Robinsons Galleria, Quezon City; Burgos Circle, Bonifacio Global City. Yes, you can still find Don Henrico’s branches if you look hard enough. Maybe the onion rings are keeping them standing. 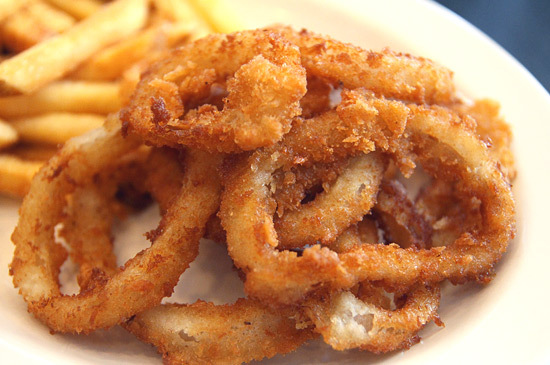 Here, you get an impressive mound of crispy, hand-battered, perfectly sliced onions. The ranch dressing on the side takes it from delicious to downright addictive. Okay, we won’t judge you if you get more, but for being too depending on the sauce, we have to leave it at the bottom six. Don Henrico’s has branches at West Avenue, Quezon City; SM Mall of Asia, Pasay City; Glorietta 1, Makati City; Tomas Morato, Quezon City; Festival Supermall, Muntinlupa City; Greenhills Shopping Center, San Juan; Malate, Manila. Chili’s has branches at SM Mega Atrium, Mandaluyong City; Greenhills Shopping Center, San Juan; Tomas Morato, Quezon City; Alabang Town Center, Muntinlupa City; Ayala Fairview Terraces, Quezon City; Greenbelt 5, Makati City; Power Plant Mall, Makati City. Modesty speaks for this red basket of skinny round onions hugged by a white crunchy coat. 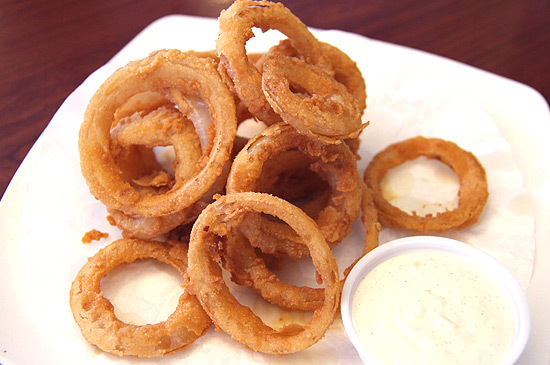 Served with aioli, these rings feature sweet, flavorful onions sliced thinly and peeking out from a delicate layer of batter. 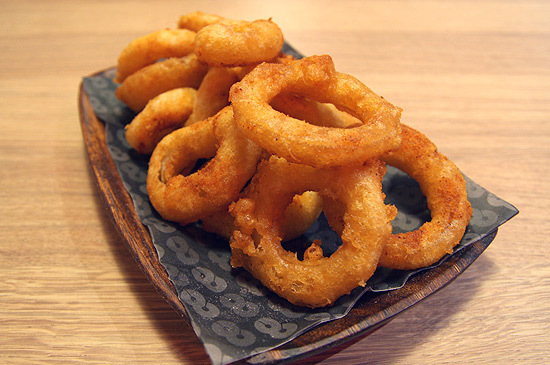 We'd tell you to eat them quickly before they go limp on your plate, but we expect you'll find these onion rings so tasty that you'll vacuum them up within minutes. Rub Ribs and Barbecue is at 64 Scout Rallos Street, Quezon City; Nicanor Street corner Baler, Makati City; 88 East Capitol Drive, Pasig City. 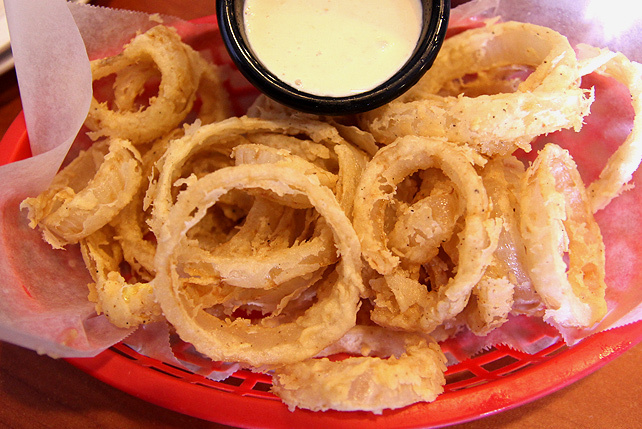 Thick and fried to a crispy golden brown, Goodfellas’ onion rings are good enough to bring peace to warring mobsters. Unless they all forget to share, of course. Fortunately, there's enough of these breaded beauties to go around, and a mild garlic dip is there to pique up the appetite more. Goodfellas is at T. Jener corner K-1 Street, Kamuning, Quezon City. 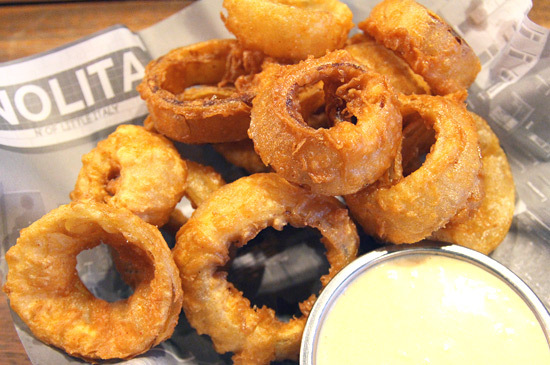 We easily fell in love with-wait, we're having a hard time choosing if we love with these beer-battered onion rings because of the flavor, the crunchiness, or that zesty dip laced with Sriracha. This is one elusive treat, but that’s exactly what love is about, right? You know what would make these amazing deep-fried munchies better? Yup, a cold one with friends. 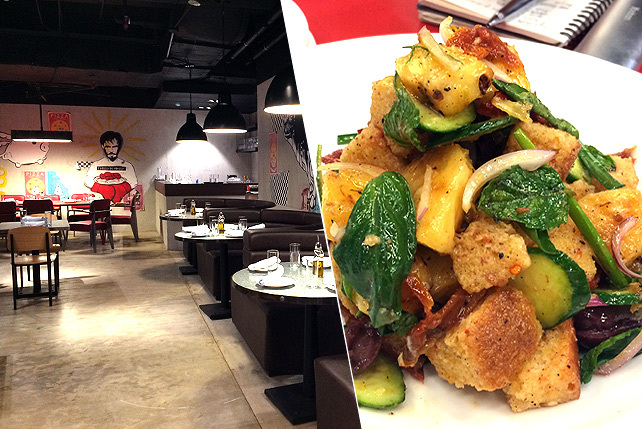 Nolita is at Bonifacio High Street Central, Bonifacio Global City. We're crazy about both the presentation and the flavor: the Onion Brick is exactly what it says it is: a thick brick (3 x 5 x 2 inches, to be exact) composed of mildly spicy, lightly battered onion rings, and it comes with Racks' original barbeque sauce and remoulade. Your job is to dismantle it ring by ring or slice through the whole thing with a fork, whichever works for you. We won’t hold it against you if you just pick it up and eat it burger-style. It’s that tempting. 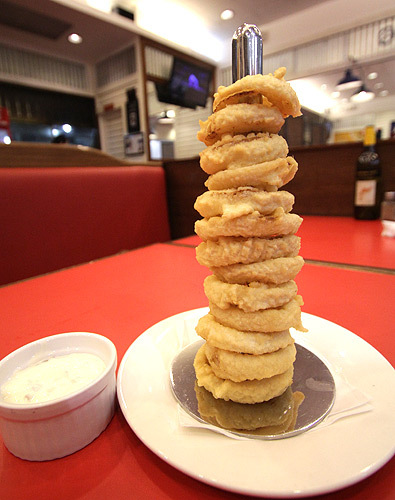 Onion rings are ubiquitous apps and we love that Racks has branches around Manila. Easier for us to enjoy it when the craving hits.